Mr. Glad loved Christmas. He loved buying presents for people, and wrapping them, with special notes and hints on the gift tags. He liked to dress up in his best clothes, to eat oyster stew, and to sing carols around the piano or while strumming his guitar. He would want us to carry on in that tradition; so we won’t be glum. I’ve been wrapping presents like mad, and not baking cookies. Maybe my cookie art, of which I have written many times on my blog at Christmastime, will be superseded by creative wrapping? I haven’t made any cookies at all this year! And I’ve had to wrap all the presents by myself, which has been fun, actually. I’m making just as much of a mess as I normally would in the kitchen. But amazingly, I had time to go for a walk this morning, too (or did I?) and I saw this manger scene with very folksy and friendly animals who wanted me to take their picture. When I got back I inspected the greens in the front yard…the smallage, chard, kale and collards are all doing famously. As I bent over to snap a picture, Whhoosh… a mighty breath exhaled nearby, and I thought, Did the neighbors just deflate their front-yard Santa? But when I looked up, it was a hot air balloon! One delight of this week was being able to attend the Christmas play that the church children put on, a story of the betrothal of Mary and Joseph, and the birth of Christ, written by one of our teens. After the children changed out of their darling costumes they had a visit from “St. Nicholas,” who told them stories about his life and gave out presents. Another strange and new thing has been shopping and cooking, cleaning and decorating, singing and eating, not alone, but with my housemate and friend Kit. Kit is a young woman who just moved to this area to be part of our parish. She had her own reasons for coming here, and I invited her to live at my house without a glimmer of foreknowledge, just because it was something I could do, while I was still somewhat paralyzed with grief. But within a month, I came to believe that God brought her here just to be a comfort and joy to me. I thought I would want to live alone, even while I believed that it’s generally not good for people to live alone. This whole arrangement, with Kit and Susan living here (Susan is house-sitting elsewhere this week) has been a great surprise and gift. Glory to God for all things! Christ is born! Glorify Him! And may your Christmas be merry. 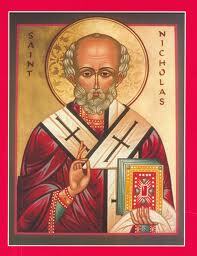 The extraordinary thing about the image of St. Nicholas in the Church is that he is not known for anything extraordinary. He was not a theologian and never wrote a word, yet he is famous in the memory of believers as a zealot for orthodoxy, allegedly accosting the heretic Arius at the first ecumenical council in Nicaea for denying the divinity of God’s son. He was not an ascetic and did no outstanding feats of fasting and vigils, yet he is praised for his possession of the “fruit of the Holy Spirit…love, joy, peace, patience, kindness, goodness, faithfulness, gentleness, self-control” (Gal. 5:22-23). He was not a mystic in our present meaning of the term but he lived daily with the Lord and was godly in all his words and deeds. He was not a prophet in the technical sense, yet he proclaimed the Word of God, exposed the sins of the wicked, defended the rights of the oppressed and afflicted, and battled against every form of injustice with supernatural compassion and mercy. In a word, he was a good pastor, father, and bishop to his flock, known especially for his love and care for the poor. Most simply put, he was a divinely good person.